Tech company Microsoft has unveiled a hinged computer designed to turn from a desktop into a digital drawing surface. 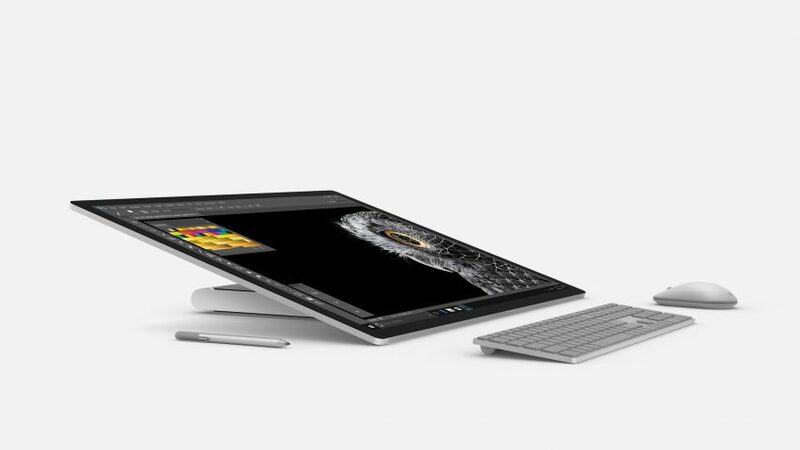 Microsoft Surface Studio is on show at Autodesk University event in Las Vegas this week, following its launch last month. Its 28-inch, 13.5 million-pixel screen sits on a hinged metal support, which allows it to smoothly tilt from an upright monitor position to an almost horizontal drawing surface. "When the screen transitions from Desktop Mode to Studio Mode, it sits at a 20-degree angle, the same angle as a standard drafting board, making it ideal for sketching, writing and designing," said the company. The device, the latest in a line of Surface products targeted at designers, has arrived as some creatives are becoming disillusioned with rival Apple. After a series of announcements in September 2016 – iPhone 7, AirPod headphones, Watch 2 – Dezeen readers felt Apple has "run out of innovation" and lost its way. Laptops and tablets in Microsoft's Surface range all come with a digital pen, similar to the Apple Pencil, but the Surface Studio allows the tool to be used on a much larger scale. "Now architects can sketch their ideas with the Surface Pen, put them into production using powerful 3D-modelling software, and review and mark up plans with a client, all on one device," Microsoft said. Also accompany the giant screen is a new accessory called the Surface Dial. Also accompany the giant screen is a new accessory called the Surface Dial. The cylindrical device can be used on the desk to scroll, zoom and navigate the interface on screen. When placed to the screen, it brings up a set of digital tools specific to the app that is open. For instance, it can display a ruler and guides for architectural drawing, or options for different brushes in drawing and rendering programmes. Microsoft Surface Studio options start at $2,999, with shipping due early 2017 – timing alongside the launch of a free Windows 10 Creators Update. This will include a variety of 3D-modelling software and opportunities to integrate them with other programmes, like those in the Office suite. Autodesk University runs from 15 to 17 November 2016 at The Venetian resort, Las Vegas.